Credit cards are a sort of amazing concept. Simply by filling out a few applications, you can go from having zero available credit to being able to sink yourself into thousands of dollars of debt — all in the practical blink of an eye. When used responsibly, the easy availability of credit cards can be a great convenience, especially for those who use (and/or churn) credit cards for the rewards. But this can be as much a curse as a convenience when you end up on the wrong side of your balances. When you have more debt than you can easily repay, spread across more cards than you can easily keep track of, one of the best solutions may be to consolidate your credit card debt with a personal loan. By obtaining a lower interest rate and putting your debt in one place, you can simplify your debt repayment process and get your finances back on track. To start the process of finding a loan to pay off your credit card debt, you need to have an exact goal in mind, as the type of loan you seek will depend largely on its purpose. In general, personal loans can be placed into one of two categories based on the length of the loan. For instance, those loans that are designed to be maintained over a longer period of time, typically 12 to 72 months, are considered to be long-term loans. Long-term loans are also called installment loans, as they are repaid in regular, predetermined installments, often in the form of a monthly payment. Loans that are intended to be short-term loans, often called cash advances, usually have terms ranging from 7 to 90 days. The majority of cash advances (and other short-term loans) are repaid in a single lump sum at the end of the loan period, consisting of the principal amount and any applicable financing or interest fees. Cardholders in search of a loan to consolidate their debt should look for a long-term personal installment loan. The extended loan terms and installment repayment structure make them ideal for those who wish to make payments over time, as well as providing significantly lower interest rates than those offered for short-term loans. 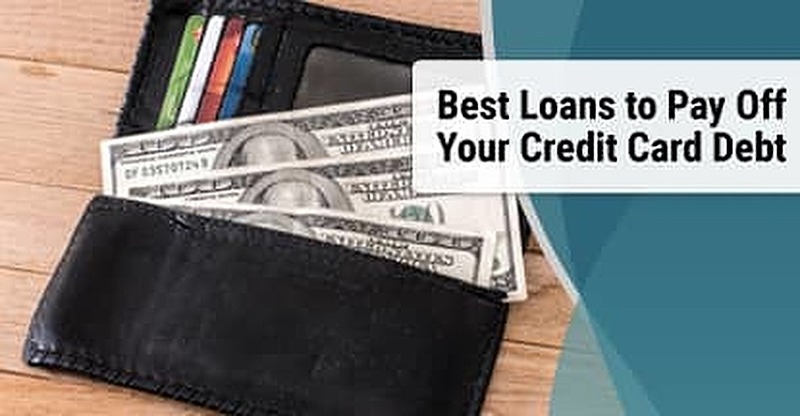 Of course, as with everything else in consumer finance, the exact interest rate you receive will strongly depend on your personal credit situation, and you’ll see bad credit loans typically have higher rates. Online lending networks, such as those of our favorite providers, can be an easy way to compare multiple offers at once to ensure you get the best possible rate. As one of the major goals of consolidation is to decrease your monthly payments, consolidation is only truly effective if you can obtain a loan with a lower interest rate than you are currently being charged. You’ll need to compare your offered rates to your current interest rates to determine whether or not to accept a particular offer. This may be particularly important for those with poor credit, who tend to pay higher rates in general. Unlike long-term installment loans, short-term loans are poorly suited for credit card consolidation due to the higher interest rates and typical lump-sum repayment structure. Furthermore, short-term loans have much lower caps on the size of the loan, typically maxing out at $2,500. That said, there may be some circumstances in which it is a preferable way to pay your credit card debt. For instance, a short-term loan or cash advance may be an effective way of avoiding a missed credit card payment, thus preventing the negative credit score impacts of a delinquent account. As with long-term loans, the exact rate and fees you pay will vary by lender, so compare offers for the best deal. Start with our top-rated lending networks to find offers from multiple lenders at once. The biggest thing to watch out for when it comes to short-term or cash advance loans is the fact that they generally must be repaid all at once. Many of those who cannot afford to repay the loan as agreed will extend the initial loan or take out a second short-term loan to pay off the first, initiating a dangerous cycle that often results in an insurmountable pile of fees and debt. If you think you may be unable to repay a short-term loan in its entirety on the required date, you should avoid taking on the loan. You may be better off contacting your creditors directly to negotiate a later payment date or some type of payment plan. If you cannot afford your current monthly payments, consider a long-term loan to consolidate your debt and lower your interest rate. While personal loans and credit cards have some similarities — both are unsecured lines of credit, for example — each has particular uses for which it is best suited. For instance, credit cards can be an excellent way to make large purchases without needing to handle cash, to make online purchases, and to earn cash back or travel rewards. Where credit cards are less suitable is as a source of cash in an emergency or as financing for large purchases you need to repay over time. On the other hand, this is exactly where loans excel. Short-term loans can provide handy cash when you need it, and installment loans were, quite literally, made for financing major purchases with a long-term repayment structure. So what makes credit cards so bad at these jobs? Two words: interest rates. Credit cards are revolving credit lines intended for short-term financing of purchases and are designed to be paid off at the end of each statement cycle. Since the creditor doesn’t expect you to carry a balance for long, the interest rates charged by the average credit card are often 16%-plus for even those with excellent credit and can range beyond 30% for those with poor credit. Additionally, credit card cash advance APRs are usually even higher than purchase APRs, making it particularly expensive to use your credit card as a source of cash. The amount of cash you can get from your card is also very limited, typically restricted to 10% of your card’s overall credit limit. Personal installment loans, on the other hand, can be obtained for $35,000 or more, depending on your credit and income. They’re also specifically designed to be repaid over the course of a year, or more, meaning they have a certain amount of guaranteed interest (read: profit) built into the loan. For this reason, installment loans often have lower interest rates than credit cards or other short-term credit lines, with interest rates averaging around 10% for the most qualified applicants. Debt consolidation is the process of taking out a single, large loan to pay off several smaller debts, thus consolidating (combining) all of your outstanding debts into one debt. Ideally, the new loan will have a much lower interest rate than was charged by all of your previous credit lines, decreasing your overall monthly payment. The first step for consolidating your credit card debt is to figure out which cards carry balances, the amount, and the current APR. This will enable you to see the size of the loan you will need, as well as what APR for which to aim. For example, if your credit card debt was distributed across four cards, A through D — as shown in the graphic — the ideal consolidation loan would be for $6,100, with an APR below 19%. Next will be researching your loan options, including determining your potential interest rate. This part is easy, as most providers will offer personalized quotes using a soft credit pull, which won’t impact your credit. Once you’ve found a provider and been approved for a loan, your money will be distributed to the account you specify on your application. Typical distribution times range from 24 hours up to a couple of weeks, depending on the size and nature of the loan. When the money clears your account, you can pay your credit card balances in the usual manner. If your credit card bills come due during the process, such as while waiting for the funds to be distributed, be sure to pay at least the minimum payments before the due date. Late and missed payments that are reported to the credit bureaus can have big, negative impacts on your credit score. Credit cards can be a great convenience and valuable financial tool — when used responsibly and in moderation. Unfortunately, it’s all too easy for your credit card debt to grow out of control, with debt spread across multiple cards and balances reaching multiple digits. As with credit cards themselves, using loans to pay off your credit card debt can be a valuable financial tool — when it’s done the smart way. Do your research, know the fees and interest rates you’ll be required to pay, and understand what to expect from the process before ever taking on new debt, even to pay off existing debt.